Confronting radioactive waste seems like a Whack-a-Mole game. The nuclear industry pops up with a new dumping or dispersal scheme just when the opposition slows or halts the last one. After millions of citizens pushed Canada’s Environment Minister to question and delay plans for an underground radiation dump right next to Lake Huron (this fight is not over yet), the Canadian companies UniTech and PermaFix now make news with plans to ship radioactive waste from Canada to the United States. UniTech wants to truck ten-thousand tons of it across the border using five different border crossings. Ten-thousand tons is a lot of material; one equivalent is a Navy Heavy Cruiser which is two football fields long, four stories high, and 60 feet wide. Cut up into trailer-sized chunks, think of thousands of truckloads of dirty bombs moving throughout the country around lakes and rivers, through cities and towns, and over bridges for years and years. Can you say Homeland Security? These so-called “low-level” wastes are not benign. The allowed “special” materials will include plutonium, strontium, cobalt-60, americium, and neptunium, which are some of the deadliest and most long-lasting poisons on Earth and the worst to come from nuclear power. These and the other 43 identified poisons give off radioactive alpha particles, beta particles, or gamma rays — or some combination — to one degree or another. It’s this “radiation” that makes the waste deadly, because exposure or inhaling or ingesting it can cause heart disease, immune system dysfunction, cancers and leukemias. The effects are cumulative too, so adding more radiation to the exposures we’ve already had shortens our lives even more. UniTech has already won an NRC “export” license allowing it to ship wastes into the US. (The plan to ship some of it back across the border to Canada is still being contested with the NRC and may end up in court.) Some of UniTech’s waste will be trucked to waste-handling factories in Tennessee, Illinois, and Pennsylvania for “processing.” The bulk of the waste is coming from Canadian nuclear reactors and laboratories. The proposed US “processing” is, according to UniTech’s license, for: “…segregation, survey, decontamination, unrestricted release, beneficial reuse.” Kay Cumbow, Secretary of the Great Lakes Environmental Alliance, warns that “unrestricted release” means the waste can be dumped in ordinary municipal landfills, and “beneficial reuse” means that contaminated metals can be used in regular smelters like ordinary recycling and ultimately used in consumer products like jungle gyms, frypans, nails and silverware. This gigantic shell game warrants deeper investigation because waste resulting from the processing and declared “un-usuable” is to be shipped back into Canada, adding another lengthy round of handling and transport risks. If all this sounds absolutely cray-cray, you may be a precautionary or a prudent person. Dr. Gordon Edwards, President of the Canadian Coalition for Nuclear Responsibility, says that the processing can be done in Canada, so there is no need for the program at all. There must be a substantial financial interest involved in order to voluntarily compound the United States’ own waste containment dilemmas by adding thousands of additional risks. 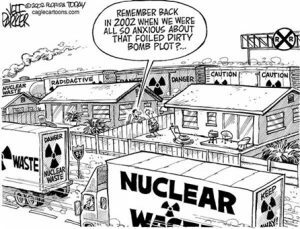 Pierre Sadik, of US Public Interest Research Group has pointed out that the Department of Energy and the nuclear industry try to create the impression that the transport of radioactive waste has been entirely safe. But this is bunk. A 1996 report by the State of Nevada documented 72 rad waste transport accidents in the US over 50 years. Hundreds of radiation clean-up workers were running for their lives Tuesday, May 9, when a “highly contaminated” waste storage tunnel collapsed at the Hanford Reservation in Southeastern Washington State. The US Energy Department ordered workers to “take cover” after what it called a “cave-in” of a tunnel used to store highly radioactive nuclear weapons wastes, some of it 72-years old and still ferociously carcinogenic. The earthen tunnels, near the so-called Plutonium Uranium Extraction (PUREX) area, were like berms and built above ground as a sort of radiation shielding system. The Hanford workers who ran for cover might have been panicked with memories of the Oct. 18, 2015 explosion and fire at a radioactive waste dump Beatty, Nevada. In that case buried, unknown sorts of radioactive waste reacted with rainwater that had seeped through both the waste trench’s earth covering, and through waste containers, causing five explosions and a plume of smoke and debris. The nuclear fireworks were actually caught on cellphone video. They may remember when 24 onsite workers inhaled the poison when a drum of weapons waste with plutonium exploded underground in Carlsbad, New Mexico on Valentine’s Day 2014. Like the waste in Nevada, much of the toxic and radioactive junk at Hanford is “uncharacterized” and unlabeled, meaning cleanup workers can’t know either what sorts of deadly isotopes are in the wastes, or what radiation hazards might be present. Left over from the nuclear arms race with the former USSR, much of the radioactive waste material at Hanford is so radioactively and thermally hot that it’s a misnomer to call that period a cold war. 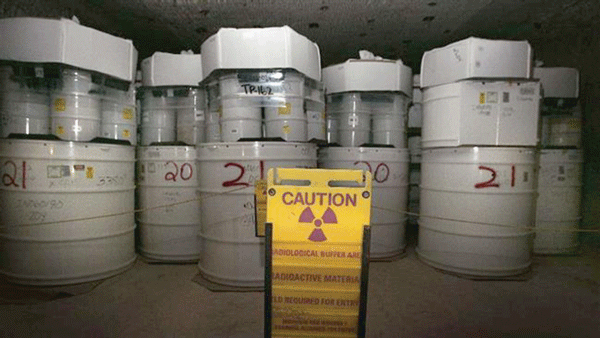 Nine plutonium production reactors ran onsite for 50 years. The last was shut down in 1988, and Hanford’s been a stop-and-start clean-up operation since 1989. Projected cost estimates for final abandonment and “good enough” declarations (no one suggests that the area can be reclaimed to the point that it can be inhabited) were once around $80 billion, but now run to $350 billion. Over three billion gallons of groundwater beneath the 580 square-mile site have been poisoned with plutonium, uranium, americium, neptunium and dozens of other “trans-uranic” (worse than uranium) wastes. The groundwater drains to the nearby Columbia River, a drinking water source for tens of thousands in Oregon and Washington. Hanford hosts 177 giant underground liquid waste storage tanks, which contain some 2.5 million gallons of radioactive sludge, stuck at the bottom. The tanks were filled with 56 million gallons of high-level or plutonium-contaminated wastes from the PUREX plant near where the “cave-in” took place. Most reports say the tanks “hold” 56M gallons” but as early as 1990 the DOE has acknowledged that 66 of them were leaking. The PUREX facility was used for decades to produce plutonium for bombs from hot uranium fuel rods taken from the nine “production” reactors. Plutonium — the most toxic material currently known to science — was extracted using a gigantic “chemical bath” system involving harsh acids and chemicals, miles of piping and conduit inside cavernous buildings employing tens of thousands of workers — thousands of whom were exposed to deadly amounts of radiation. McClatchy Newspapers reported in 2015 that at least 33,000 such workers died of cancers caused by their workplace radiation doses. The actual number is probably much higher. 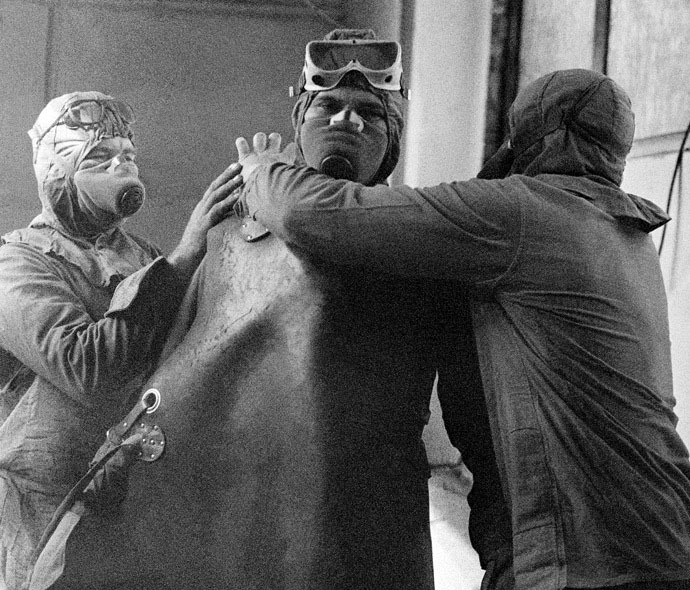 “Liquidators” getting ready with lead aprons to climb onto the roof of Chernobyl reactor No. 4 after the initial explosions and fire. (RIA Novosti) Half-a-million military conscripts were ordered to work in severely radioactive areas. Ukrainian Health Minister Andrei Serdyuk estimated in 1995 that Chernobyl’s death toll was 125,000 from illnesses traced to radiation exposure. Of course it misinforms the public to ignore the fact that reactor disasters have poisoned the whole earth, but why? One reason is that downplaying the severity of Chernobyl — and Fukushima-Daiichi as well — sugar-coats the threat posed today and every day by operating power reactors beyond their original license limits, or near earthquake faults, volcanic regions, or tsunami zones. The hidden agenda behind the profit-driven media’s deliberate belittling of reactor accidents — and the dangers of radiation — is to protect significant advertising revenue. Big utilities, big pharma, big mining, big universities, and big weapons labs makes billions of dollars from increasing the “background” level of radiation. Official background exposure was 170 millirems per-year for decades; 18 months after Chernobyl it doubled to 360 mR/yr; and it nearly doubled again a few years ago to 620 mR/yr.) “Nuclearists” intend to keep it this way, even if it means buying pricey ads claiming that reactors are safe and small radiation doses are harmless. Today, remember to read corporate minimization of Chernobyl’s effects with a radioactive grain of salt. Nuclear power supporters like to say, “Nuclear waste disposal is a political, not a scientific problem.” Scientists refute this slogan every day. A case in point is the Canadian Environment Minister’s second “do over” order issued to Ontario Power Generation regarding the company’s waste dump idea. The 15-page order, issued April 5, rejected the company’s sophomoric answers to a previous “not good enough” finding by Canada’s Minister of Environment and Climate Change, Catherine McKenna. OPG wants to bury 7 million cubic feet of radioactive waste in a deep hole less than a mile from Lake Huron, on its own property on the Bruce Peninsula, northwest of Toronto. It’s there that OPG runs the world’s biggest rad’ waste production complex — the Bruce Nuclear Station — eight old power reactors in varying states of repair and disrepair. The company proposes digging 2,231 feet down into part of its 2,300-acre compound on Lake Huron, and burying all sorts of radioactive material (everything except waste fuel rods), including a “significant amount” of carbon-14, a cancer agent with a deadly radioactive “life” of 57,300 years — i.e. ten 5,730-year radioactive half-lives. After two years of public hearings into the question of placing long-lasting poisons next to a major source of drinking water, a federal Joint Review Panel in 2015 recommended approval of the project to Minister McKenna. In requiring a study of alternate potential sites for deep disposal, Minister McKenna ordered OPG to make “specific reference to actual locations.” Instead, OPG tried to get away with citing two enormous geological regions that it said might be suitable. As Jennifer Wells and Matthew Cole reported in the Toronto Star , OPG’s “actual locations” covered an area of 726,052-square-kilometres — about 75% of the Province of Ontario. This blatant attempt at scamming the government didn’t fool McKenna, a public servant who is actually doing her job. In one of OPG’s more garish displays of environmental racism, the company’s Dec. 2016 report failed to analyze or even acknowledge the land use Treaty Rights of Indigenous or First Nation peoples. Minister McKenna’s April 5 rebuke rightly demands that OPG provide “a description of the land and resource uses for the alternative locations that highlight the unique characteristics of these locations from the perspective of Indigenous peoples. A five-year-old undergoes a thyroid exam in February 2015 at a clinic at a temporary housing complex in Nihonmatsu, about 40 miles from the devastated Fukushima reactor site. Photo: Toru Hanai, Reuters. March 11 marks the 6th anniversary of the world’s worst nuclear reactor disaster: the 2011 meltdown of three large power reactors on the Pacific Coast of Japan—Fukushima Daiichi—following a staggering 9.0 magnitude earthquake—the biggest in recorded Japanese history—and its 50-foot tsunami. The “station blackout” or total loss of electric power and cooling in six reactors, and the consequent hydrogen explosions and uncontrolled overheating and “melt-through” of three reactors, has resulted in the most devastating and complicated radiation catastrophe in history. Fukushima is regularly misreported as less drastic than the singe-reactor catastrophe at Chernobyl, in Ukraine, in 1986. But France’s Institute for Radiological Protection and Nuclear Safety, reported five years ago that Fukushima was already the biggest single spill of man-made radioactive materials into to the marine environment ever seen or recorded.1 At least 300 tons of highly contaminated runoff have poured daily into the Pacific ever since. The disaster of “Fukushima squared” (earthquake + tsunami + station blackout times three melted reactor cores) was caused by deliberate decisions made by General Electric, Tokyo Electric Power Co. and the government: to build reactors in earthquake zones; to place emergency back-up generators in flood-prone basements; and to ignore long-standing warnings about inadequate seawall protection. Japanese soldiers collect contaminated leaves in Fukushima Prefecture. AFP/Getty Images. Japanese authorities now overseeing Fukushima’s disaster response are pressuring citizens to live in or return to areas that are contaminated with up to four times the annual radiation exposure allowed in similarly contaminated areas around Chernobyl.4 Thousands of Japanese incinerators are burning thousands of tons of contaminated debris collected in clean-up efforts—spreading radiation to the winds; and millions of tons of related debris will reportedly be used in road construction throughout Japan, exposing highway workers and nearby residents to long-term radiation risks. On this somber anniversary, we remember the 19,000 people killed by the tsunami, the 160,000 evacuees who fled radiation zones contaminated by wreckage, and the infants, children and parents who endlessly endure examinations and treatments for thyroid problems stemming from the disaster. Some 27,000 so-called “voluntary evacuees”—people who fled their homes in areas beyond mandatory evacuation zones after the disaster began—were to lose their six-year-old housing subsidies at the end of March, 2017. Thousands of Japanese, wary of government assurances that radiation was limited to official exclusion zones, chose to leave their homes. Many families reported suffering health problems beyond the officially contaminated area, including nose bleeds and nausea. Groundwater from the mountains behind Fukushima gushes into the quake-smashed reactor foundations, pours over the melted fuel and becomes highly contaminated. This water then runs to the Pacific Ocean which is undergoing the largest radiation dump in recorded history. The Pacific covers more than 30% of the Earth’s surface, and with a surface area of more 62 million square miles, its basin is larger than the landmass of all the continents combined. Part of the reason that whole-sea contamination can result from Fukushima was revealed last February when radiation gauges for the first time got near the melted fuel. News accounts first called this a “spike” in radiation levels, since the highest reading even during the disaster’s first days was 73 sieverts/hr. Further, the 530 sievert reading was taken some distance from the melted fuel, so the actual lever could be 10 times higher than recorded, according to Hideyuki Ban, of Japan’s Citizens’ Nuclear Information Center, who spoke to the Washington Post. Exposure to just one sievert is enough to result in infertility, hair loss and cataracts. According to the National Institute of Radiological Sciences, a mere four sieverts can kill a person.